Context-based analysis can be done by manually drawing regions of interest. 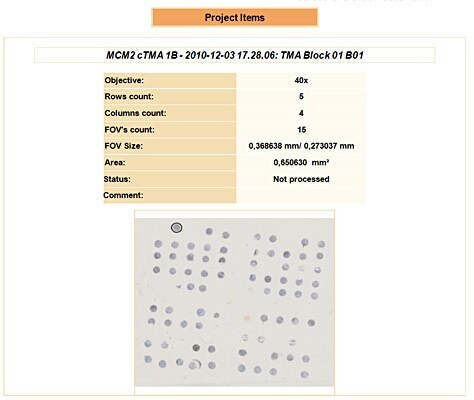 TMA can be analysed and also detected on imported files. Analysis profiles can be created and used for automated analysis. TissueQuest is also available as a standalone software. Images to be analysed in TissueQuest must be provided as 8 bit monochrome greyscale images (one image per channel). Overlay (colored multichannel) images CAN NOT be analysed. 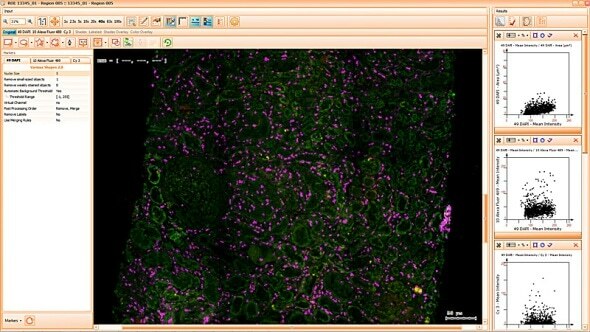 TissueQuest is an image analysis software for the FACS-like analysis of samples stained with immunofluorescent stains. TissueQuest can analyse images from epifluorescence as well as those from confocal systems. Full 64 bit support will greatly increase the number of samples which can be analysed in one project. The latest processing libraries have been integrated which will increase processing time by up to 40%. The cache from TissueFAXS projects will be used, this eliminates wait time while the project is loaded into the viewer. 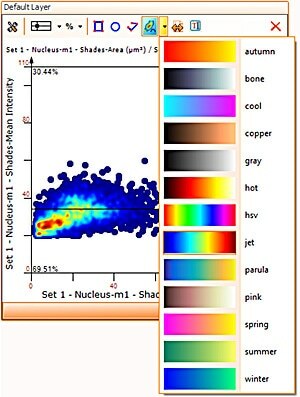 Finally, TissueQuest has a heatmap feature in scattergrams. This feature will show areas of objects density in the scattergram which may not be visible in highly populated scattergrams and so deliver more information when working with them. TissueQuests fully automated template based analysis is optimised for clinical routine and research applications and allows complete walk away operation. The user just has to load samples into an analysis project and to manually define regions of interest, if any are wanted. Then the template can be loaded. After this, analysis can be started. While, at a first look, it may appear to be just another form of displaying data, there is much more to it. Combined with segmentation images it is also a simple and intuitive tool to visually validate results. TG calls this "Backward Gating" and "Forward Gating". 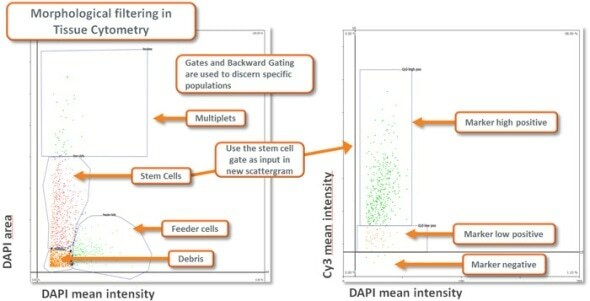 Morphological Filtering using Tissue Cytometry technology combined with appropriate planning of the analysis provides a highly flexible and capable instrument for extracting specific data from a sample (see image below). TissueQuest uses algorithms for nuclear and cell compartment segmentation. 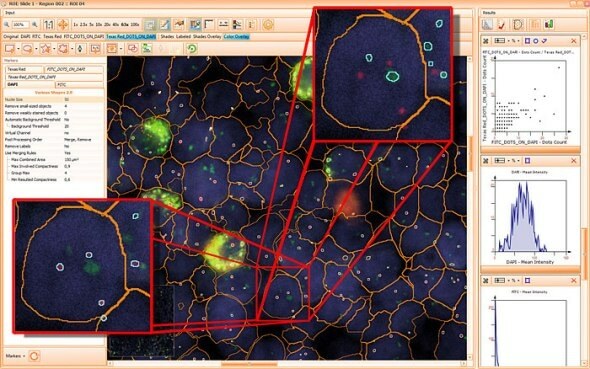 It also provides an algorithm for stained area detection as well as algorithms for the detection of dots inside of already detected cell compartments. The nuclear segmentation algorithm is highly efficient in difficult situations in tissue and can be set with two values only - mean nuclear size and nuclear channel background threhshold. The cell compartment algorithm provides a large amount of flexibility with a few simple settings (see below, yellow=segmented nuclei, blue nuclei positive for DAB or cytoplasm positive for Permanent Red marker). 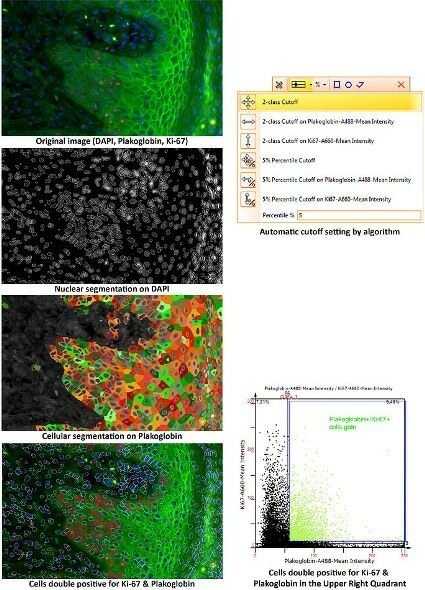 The image below shows segmentation and the use of Tissue Cytometry technology to automatically identify colocalisation. The Total Area algorithm segments stained areas in a sample (see image below). The small dot algorithm provides small dot detection ideal for FISH and other applications in which the quantification of small objects within cellular compartments is needed. The image below shows the quantification of FITC and Texas Red FISH dots inside of the nuclear compartment. TissueQuest fully supports the analysis of Tissue Microarrays scanned either with TG TissueFAXS systems or those slide scanners for which TissueQuest provides importers. For analysis projects of scans coming from TG TissueFAXS systems the autodetected TMA regions will be imported. For scans imported from other scanning systems without detected regions the TMA autodetection feature is also available in TissueQuest. TissueQuest provides four modes for the export of analysis data, ranging from simple prefabricated reports for internal presentations to selective data export from all analysis projects from a complete scientific project. There is a special pathology oriented data export feature for the small dot algorithm data, which has been buit according to pathologists requirements for FISH analysis. All TG data export modes write data to Excel, CSV and pdf formats. TissueQuest features include a registration and comparative analysis capability for differently stained consecutive samples. Compare sets provide grouping features for multiple scattergrams and histograms as well as overlaying them.